In keeping with all things James Beard, here is his recipe for Garlic Soup! The following quote alone makes me want to time travel to meet this amazing man!!! Melt fat in a heavy saucepan over low heat. Add garlic and shake over gentle heat so the garlic cooks without browning. It should just melt in the fat; letting it brown is fatal as the flavor turns bitter. Add chicken stock and season to taste with salt and freshly ground black pepper. I also like to grate a tiny bit of nutmeg in. Simmer for 15 to 20 minutes, and then force through a sieve or food mill to purée the garlic. Reheat the soup. Beat egg yolks, and stir in olive oil. Stir some of the hot soup into the egg yolk mixture to temper them, and then stir it very gently into the soup and heat. Do not under any circumstances let the soup come to a boil, or the yolks will curdle. 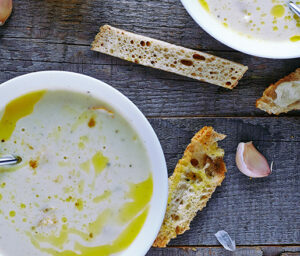 Serve in large soup plates, ladling the soup over pieces of crisp toast, one to a plate.